Almost every trick has been tried in the difficult art of making a movie sequel. Rarely do we find one that is premised on proving the previous movie wrong. Wreck-it Ralph begins with the titular villain discovering his need for a sense of self-worth, and ends with him having found it in the company of a friend. It is a standard happy ending, almost a classical Disney happy ending. But then comes Ralph Breaks the Internet, and it loudly proclaims it was a big mistake. It was the wrong type of happy ending. How so? Remember Ralph’s final line in the previous movie: “If that little kid likes me, how bad can I be?” This seems to make sense within the context of Ralph’s programming: he’s written as the eternal villain in a story where his only available choice is to destroy everything; of course the inhabitants of that world have never had a reason to like him, and the eye-opening discovery of different ways of relating to people makes him grow as a person. For the first time, he realizes he can have human contact that is not destructive. And that’s valuable. But he learned the wrong lesson from it. Let’s scrutinize Ralph’s reasoning in that final scene: he finds reassurance of his self-worth in the fact that he succeeded in inspiring affection instead of revulsion in another person. That has got to be an earth-shattering milestone for anyone with his life story. However, the sequel looks deeper into that feeling, and finds something unexpected: Ralph learned the wrong lesson from that experience. Against decades of the usual sweetness and formulaic plots we know to expect from Disney, this movie presents a very different, almost heretical statement: the previous movie got it all wrong. You should not base your self-worth on someone else’s admiration of you. While it’s always nice to make a friend, you should not yield to the temptation of defining your entire self in terms of that relationship. It’s toxic, and it’s disrespectful to your friend. Vanellope gets this much sooner than Ralph: when she suddenly finds herself without a purpose in life, she realizes that her friendship with Ralph, while important, cannot be everything that she is. She has the very healthy need to stand on her own feet as an individual, and that terrifies Ralph. He hasn’t grasped the concept of self-respect not based on external validation. So he inserts himself into the role he wishes Vanellope would play. And thus begin the problems. This is where the whole princess interlude fits thematically within the movie: Disney has built its media empire on the commodification of codependence, and somewhere in the corporate machinery an enlightened soul managed to make the case for a need to correct that record. Vanellope finds herself joining a prestigious club of women whose value was not defined by their daring adventures or their unique talents, but by the narrative convenience of having a man come to fix all their problems. And Vanellope wants none of that. Maybe so many years of working with Felix have conditioned Ralph to viewing all human relationships in terms of broken things needing repair, but Vanellope doesn’t need Ralph to magically fix her life, and she respects him too much to accept the role of fixer in his. When Ralph still fails to get the message, his immature side acquires a physical form and finally beats sense into his hard head. The internet is a perfect place for this story to happen: we all know the enticing invitation it makes to our wildest impulses. Most of us learn to measure our words and consider our actions in physical space, but once online, we feel like we have permission to be mean. We can too easily turn primitive, selfish, spoiled. We can become unrecognizable to ourselves. Ralph Breaks the Internet turns the metaphor of the internet troll and makes it literal. Consider the entitled comments that emerge, usually from male readers, every time a public figure, usually a female one, deviates from the narrow expectations of acceptable behavior. Every time a model or actress lets herself be seen with her natural body hair or without twenty layers of makeup, or does anything except what we have tacitly defined her to be, some of us can feel a quite primal, and quite misguided, urge to reassert dominion. This is the same mistake Ralph commits when he doesn’t respect Vanellope’s right to find the excitement she seeks in her own way. 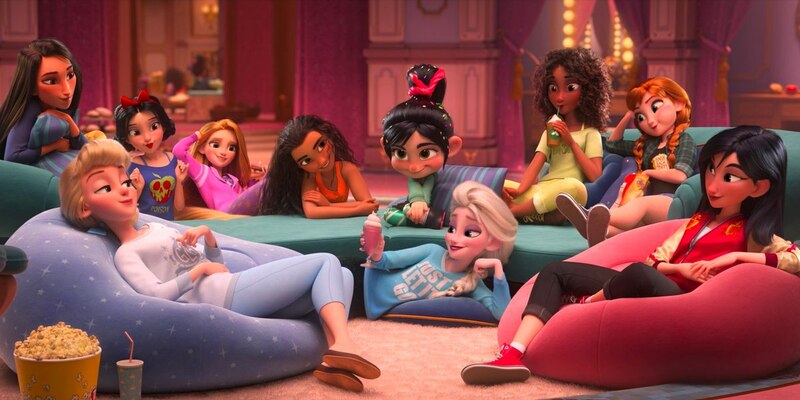 Ralph Breaks the Internet is all of us making the internet an uglier place by defining ourselves according to an admiration/outrage axis. When we demand other people reshape themselves into the empty spaces in our lives, we become the wrecker in the story. Being presented face to face with such a distorted caricature of ourselves is a rare occurrence that Ralph fortunately grows from, but the rest of us seldom have that learning opportunity.